Hello! I’m Amy, the new ECOSchool intern, and just arrived on Thursday. After a series of travel fiascos, including missed flights, missed buses, and missed phone calls, I was finally rescued by Dani and John in the McDonald’s parking lot in Bulls. Since, then, I have been adjusting quite nicely and am enjoying New Zealand immensely. On Friday morning, at the start of my first full Kiwi day, we dove right into my first EcoThrifty project: constructing a solar cooker. Let me start off by saying that it was always a distant dream of mine to own one of these ingenious devices myself. Little did I know that achieving this involved little more than a good-ol’ Google search, some household materials, and a couple hours of intern time. The patterns John found included measurements for the sides and angles for folding the parabolic shape. First, he drew up the pattern in full scale on a sheet of salvaged cardboard (from a box that formerly held a passive solar hot water heater, no less). As we didn’t have a compass, we made our own by folding up the corner of a sheet of scrap paper into 15° angles, and marked these into the cardboard. Next, we creased all our folds with a metal ruler, and got an idea of the general shape of the cooker. 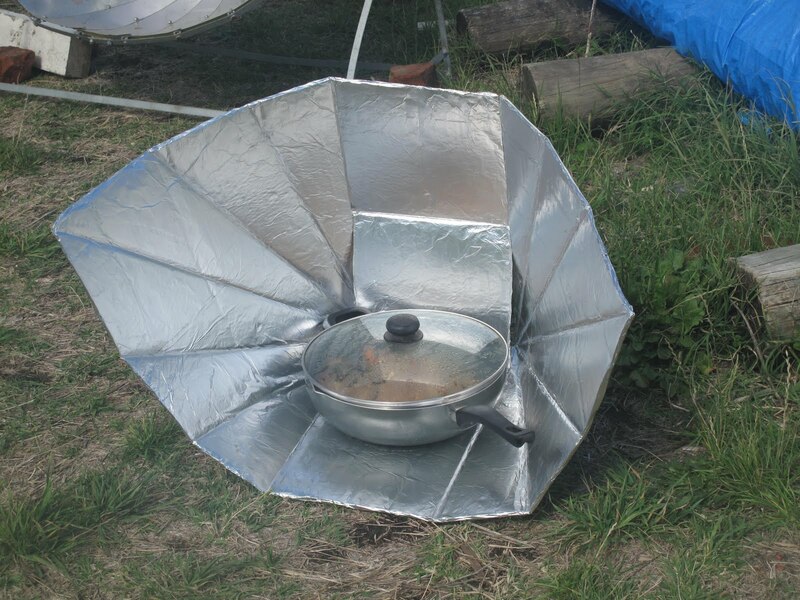 In order to transform these materials from cardboard scraps into a mean, green cooking machine, we needed to cover them with a reflective surface, which turned out to be aluminum foil. We were really taking the whole do-it-yourself thing quite seriously, so we decided to make our own glue. As we were fresh out of animal hooves, we discovered the next best thing: flour and water! Affectionately known as “Marxist Glue,” its manufacturing process involved boiling water in our electric fry pan, and adding in a flour-water mixture while stirring it over the heat to thicken the mixture into a nice gloppy glue. Finally, we taped the two foil-covered components together, and, “Voila!” we had a cooker. We put it to the test at dinnertime, using the somewhat weak rays of late afternoon sun to successfully warm up some leftovers. For anyone interested in embarking on a similar project, go for it. It was quick, cheap, and easy, and while we have yet to try it in full sun, it did work. Now we are dreaming of our next creation, a solar hot dog roaster! As soon as we find some suitable cans, we’ll get to work. Look for us hawking sausages on a Wanganui street corner in the near future.